Steep access. Please contact prior to visit. The very favoured micro climate of kindly winter temperatures and shelter from the wind allow exotic and half - hardy plants to flourish. 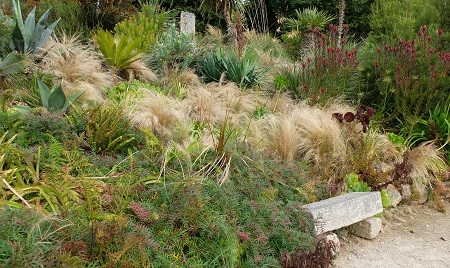 The planting schemes are appropriate to the varying individual habitats but carry a unifying theme of sculptural forms, textures and colours, complementing what nature has already provided. 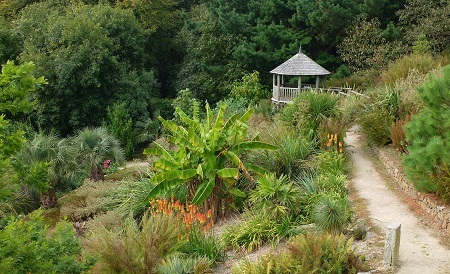 The plants create a restful verdancy whilst having their own drama through form and foliage - in particular through the notable collection of palm trees, tree ferns, succulents and bamboos. Dramatic landscape and planting provide the backdrop to contemplative but inspirational artworks. 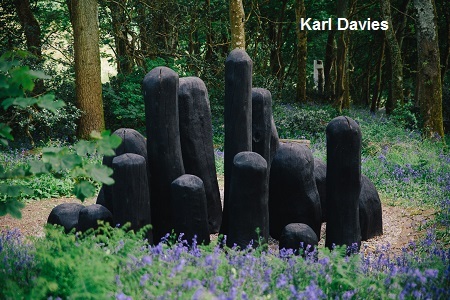 Internationally renowned artists such as James Turrell, David Nash, Richard Long, Tim Shaw and currently Peter Randall-Page (on temporary loan) have interacted with the setting to create site-specific permanent work, which harmonise with the landscape. A temple-like "Skyspace"has been created at the prominent site at the high point in the valley, entered from the base of the hill through an underground corridor. 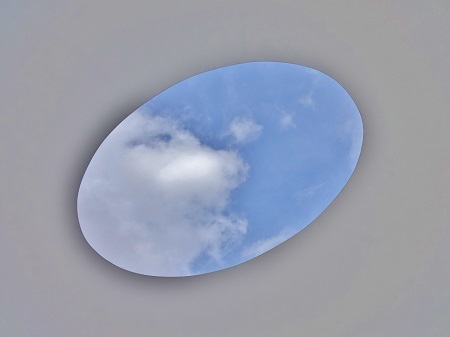 One is led along a rising passageway to an interior space, an elliptical chamber whose ceiling frames the sky. 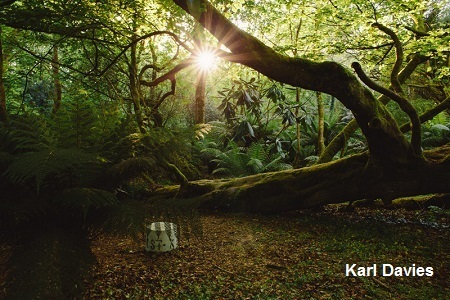 2019 - Tremenheere Sculture Garden open daily from 10 February- see website for full information. Tearoom open all year. 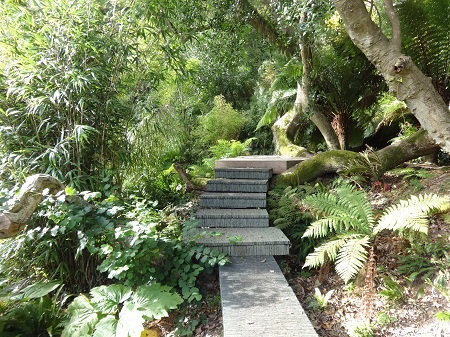 If you want to take a break near Tremenheere Sculpture Garden, why not stay in one of our recommended hotels. Each hotel has genuine guest reviews enabling you to book from anywhere in the world in total confidence. Not only do we feature hotels near the garden, we also feature hotels worldwide and at all major airports. Special prices up to 70% off standard rates as well as hundreds of exclusive deals. Look now for places to stay Penzance - click here.